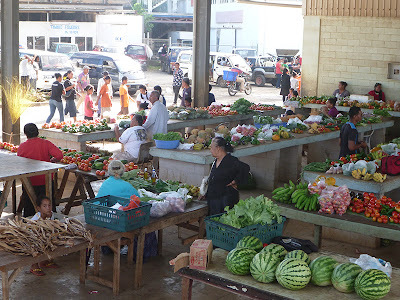 This is the last in a series of posts about Tonga that I was unable to make while we were still there. Neiafu, on the main island of Vava’u, was our home base during the month we were in Tonga. (Vava’u is both the name of an individual island and an entire island group.) In Neiafu, we were able to satisfy the logistical needs of checking into the country, obtaining groceries, getting fuel, having laundry done, and communication (via internet or phone calls home). We also enjoyed a pleasant range of cafes and restaurants in a variety that we hadn’t seen since before entering French Polynesia. From Neiafu, we made excursions to the outer anchorages, relaxing for four to seven days in more remote settings before returning once again, to Neiafu. Most of the islands in the Vava’u Group are only a couple hours to a day’s sail away from the main port, so you truly have the best of both worlds in this part of Tonga. 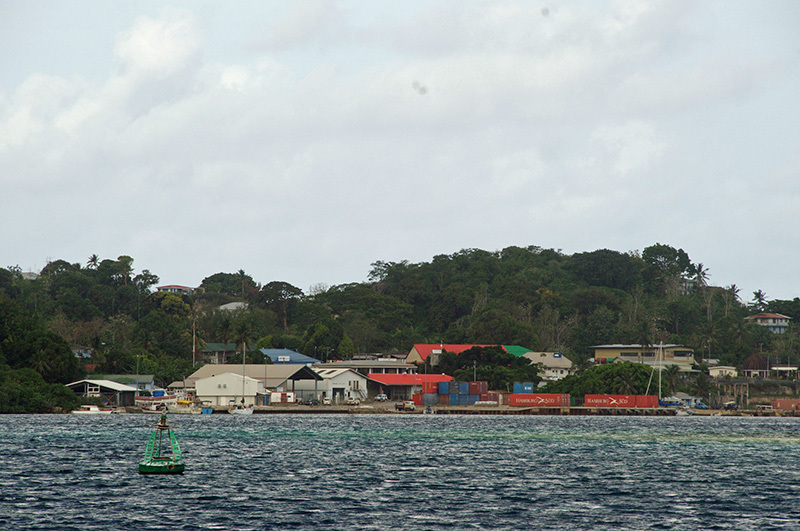 The first thing you see when you enter Port of Refuge Harbour in Neiafu is the Customs dock. Arriving boats tie up here until they are cleared by Agriculture and Customs. Further down, the skyline is dominated by the large white Catholic church on the hill. On the waterfront at the far right in the above picture (cut off by the edge of the photo) is the Aquarium Cafe, a popular cruiser hangout with good food and free (albeit slow) Wi-Fi. We got the impression that the name and ownership of this waterfront establishment have changed many times over the years. You can also see the edge of the mooring field at far right. One of the most exciting experiences we had in Neiafu was touring a traditional Polynesian vaka moana, or double-hulled oceangoing canoe. The vaka we toured was one of a fleet of seven vakas that are part of the Pacific Voyagers Project. 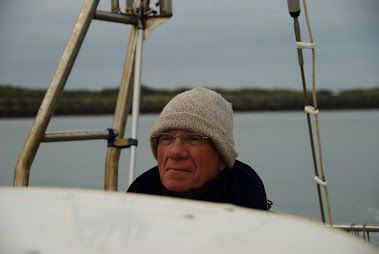 The vakas and their crews are currently sailing the world's oceans acting as ambassadors for both the past and the future, educating people about the legacy of Polynesian seafarers while experimenting with modern methods for sustainable vessels on the high seas. The vaka we saw was traditional in its double-hull, huge wooden steering oar (that in a big wind takes two or more husky human navigators to keep under control), and intricate carvings on every surface: most notably the star compass carved into its steering deck. (Today's vaka crews utilize celestial navigation, like their ancestors.) However, the vaka we toured also had modern elements such as electric propulsion via lithium ion battery banks charged via a large solar array. The motors are deployed in times of no wind and for maneuvering to docks. Usually, only one vaka visits a port at a time, but sometimes they travel as a fleet for special events. 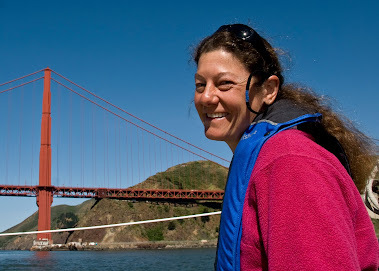 While visiting the vaka, its skeleton crew of six (a full crew consists of 14) recounted the emotional experience of all seven vakas sailing together under the Golden Gate Bridge into San Francisco Bay. Thousands, if not tens of thousands, of spectators had turned out to welcome them, including leagues of Fijians, Samoans, Tongans, and other Pacific Islanders now living in the United States. After a long ocean voyage, during which much time was spent in solitude or near solitude, the welcome was overwhelming. 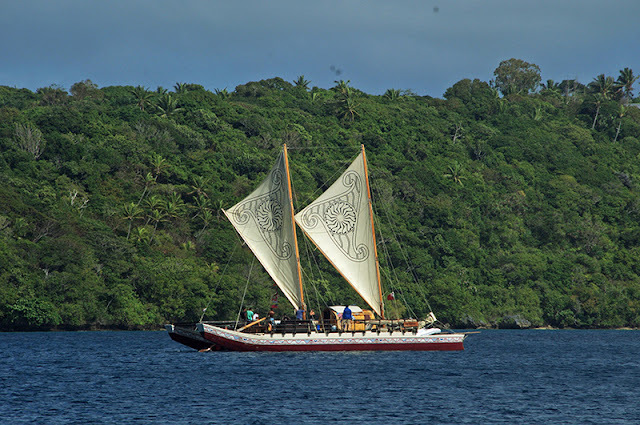 A couple of days after our visit, we got to see the sails raised on the vaka as she headed out to tour some of the anchorages in the Vava'u Group. Neiafu’s waterfront boasts a large public market where produce, local fish, eggs, locally farmed vanilla, and traditional crafts are sold. Crafts include beautiful hand-woven pandanus baskets, kava bowls, and cow bone (formerly whale bone) carvings and jewelery. Utukalongalu Market is located just across the street from the Customs shed. 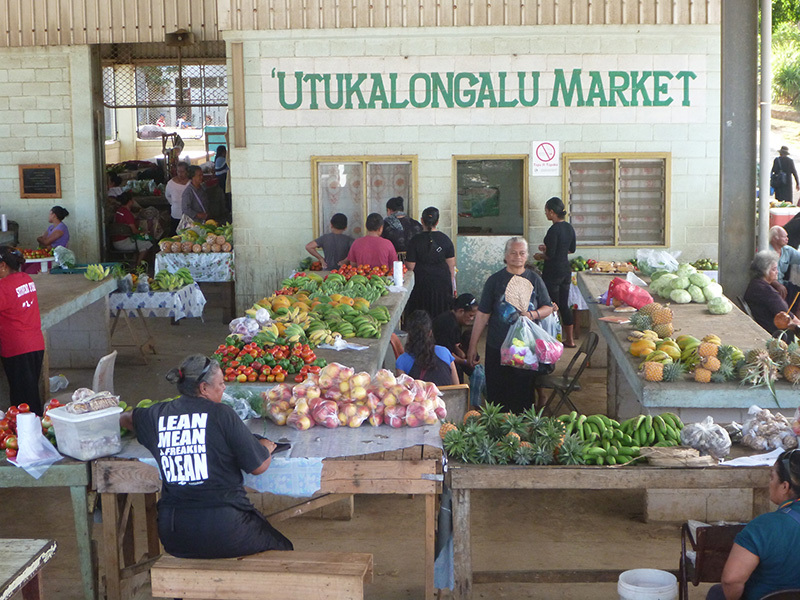 I enjoyed shopping at the market, where the vendors were quick to teach me new Tongan phrases and were happy to describe how to cook the local produce if I asked. Neiafu’s population is large enough to warrant the presence of multiple churches, and there is a local Wesleyan church along with the Catholic churches in Neiafu. On Sundays, all the stores and businesses are closed (except for a couple catering to Westerners), and the streets are full of people dressed up in their Sunday finest heading for church. At a given time, you can hear the voices from up to three separate church choirs resounding simultaneously. 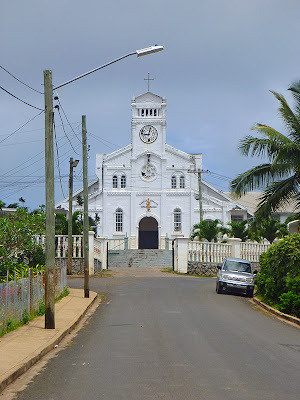 One of my favorite mental images of Neiafu was seeing a large pig crossing the street in front of this church one morning. Although I didn't have my camera that day, I have posted pictures of pigs in Tonga on previous blog posts and mentioned how they are allowed to roam freely. This can cause problems and hard feelings in a large town like Neiafu, where another's pig might trample your garden, but you are not legally allowed to harm or kill another person's pig. While the pigs are free to roam, and most don't wear identification collars or tags, apparently everyone knows whose pigs are who's! Tongan culture is very conservative. 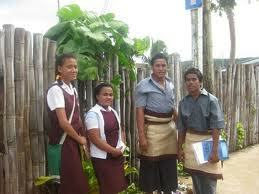 In addition to being highly religious, Tongans historically have had a modest dress code. Today, the dress code in Neiafu is slowly modernizing. More and more women are getting away from the restriction of always having your shoulders and knees covered (a tough one to observe in the tropics!). 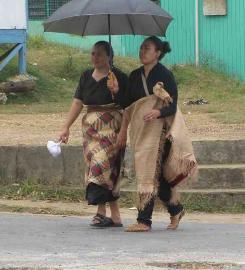 Yet by the same token, nowhere else in the South Pacific did we observe so many people wearing traditional dress. The most noticeable aspect of Tongan dress is the traditional woven mat, or ta'ovala, which is worn by both men and women as a sign of respect and authority. 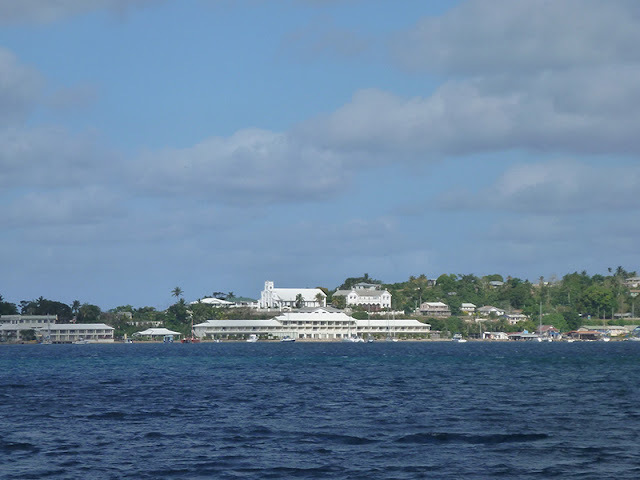 As usual, I was too shy to ask the Tongans I saw if I could take their pictures, so I have included some from other sailboat blogs. Although fewer people are seen wearing it nowadays as an everyday garment, on formal occasions ta'ovala are worn by everyone, and they are required dress for government workers. On Sundays, the streets of Neiafu are full of Tongans wearing ta'ovala in every shape, size, and pattern. There are many creative and beautiful variations of this garment, differing in the width and thickness of the woven materials (pandanus and other plant materials), to their color, to their shape. Some ta'ovala are solid mats, while others hang in strips with a lacy appearance. The ta'ovala is worn over a cloth, wrap-around skirt called a tupenu. Both men and women wear tupenus, although these days men also are seen wearing pants. 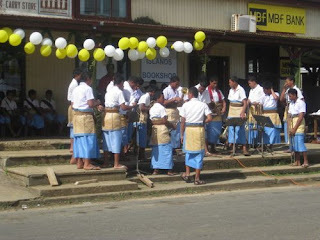 School uniforms, which are ubiquitous in Tonga, consist of tupenus and ta'ovala for boys and jumpers with blouses for girls. Young girls wear their hair in braids or plaits with brightly colored ribbons matching their school uniforms. Another article of Tongan dress is the kafa, a woven tie used to secure a ta'ovala. You can see some of them in the photos above. The kafa is not as common as it once was, but traditional kafa are woven out of fiber from coconut husks or even human hair. I was very honored when the hair stylist who cut my hair asked to keep my ponytail to make a kafa for her young son's school promotion outfit. While Tongan culture, in general, is modest and conservative, there was one place in Neiafu where people could go to cut loose: Tonga Bob's. Tonga Bob's is a bar which holds different events on different evenings, such as Quiz night (like Trivia night in the U.S.) On Wednesdays, Tonga Bob's has a popular transvestite show in which the spirited dancers interact with and tease the audience. Overheard in a restaurant before attending the show: "The prettiest girl there was a guy." In Tonga, a man who behaves like a woman is formally called a fakafefine or fakaleiti. Informally, they call themselves leitis. Although they have different names on different Pacific Islands, men who identify as women are considered a third gender throughout the South Pacific and have historically fulfilled specific social and cultural roles that I don't know enough about to comment on. Most fakaleiti in Tonga are not transsexuals. 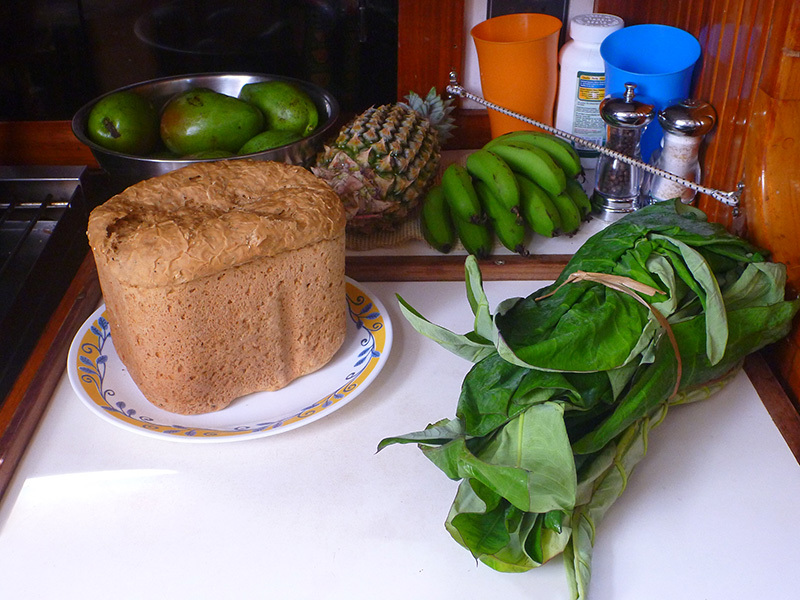 Fakaleiti are accepted by Tongan society, unlike members of the Western LGBT community, many of whom still experience wide scale discrimination. We truly enjoyed the mix of traditional and modern culture, the diversity of both Tongan and ex-pat communities, and the range of services that we experienced in our Tongan home base, Neiafu.